▪ Why A Professional Sound Card? As you can see, two 2 of 3 types of effects require audio input to work. MADRIX can work with an audio signal and it can work without an audio signal. But audio input is highly recommend. S2L and M2L Effects will create unique real-time effects based on sound, which will take your lighting display to the next level. MADRIX cannot play back audio. Instead, the software uses incoming audio signals to create lighting effects. Audio input can come from different sources [internal or external]. It is just a matter of configuration. MADRIX will allow you to set up every device that the Microsoft Windows operating system offers for recording. Why A Professional Sound Card? We recommend to use a professional sound card—preferably with ASIO support­­—to get the best results from the MADRIX audio analysis. MADRIX also natively supports the Windows Audio Session API [WASAPI]. This method automatically delivers very good results [even without ASIO]. Sound cards that provide an ASIO driver can provide excellent results. The MADRIX audio analysis will be very fast and precise. Sound2Light and Music2Light effects will look even better. It is therefore recommended to use a sound card with native ASIO support. However, this is not a requirement. ▪ Make sure to configure audio input in MADRIX. 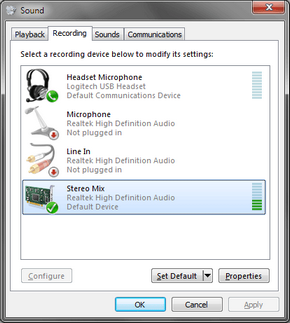 ▪ Activate the Audio Analysis via the Audio button while playing some music on your PC, for example. - FPS shows the currently used value as it is and as (targeted). - Values of 100 or higher are preferable [lower values might also work well]. The general case is that MADRIX automatically finds a primary audio device and is able to work properly right from the first start. Often that means that you will not have to configure audio. - Enables the standard Windows audio drivers. It is activated by default. ▪ Audio Device - The software scans your system and the Windows Audio Mixer Control for recording devices available for audio input. You can properly assign your Line In, Microphone, or other specific devices by selecting the device from the drop-down list. Labels vary according to manufacturers and sound cards but often include "CD-Player", "Microphone", "Wave", etc. ▪ Use For S2L Effects - Is activated by default. Deactivate this option if incoming audio signals should not be used for MADRIX S2L Effects [not recommended]. ▪ Use For M2L Effects - Is activated by default. Deactivate this option if incoming audio signals should not be used for MADRIX M2L Effects [not recommended]. If MADRIX should use an audio input signal, you have to define the proper audio source in the Windows control panel first. ▪ Please close all running applications. ▪ Call up the context menu by using a right click with your mouse in this window [Right Mouse Click]. - Afterwards, also click Set as Default Device in the context menu. - Stereo Mix is recommended. ▪ Or you can use any other input source. ▪ Finally, Stereo Mix [or any other input source] is activated and correctly set as recording source. ▪ MADRIX can now analyze your music from software applications [such as Windows Media Player or Winamp] or use the signal from your defined input source. ASIO [Audio Stream Input/Output] is a widely known audio standard. Above all, the standard provides low latency; a feature often requested by professionals. When using ASIO, the MADRIX audio analysis will be faster and more precise. ASIO is a registered trademark of Steinberg Media Technologies GmbH. ▪ Before using ASIO with MADRIX, please make sure that the ASIO drivers are installed on your computer. If the drivers are not installed, MADRIX will not be able to find the ASIO audio hardware. ▪ It is recommended to connect external ASIO hardware [a USB sound card, for example] directly to a USB controller of your PC. It is not recommended to use a USB hub or the front-USB of your computer. ▪ The audio configuration window will change. ▪ Audio Device - Select your interface or sound card in this drop-down list. ▪ Left Channel - Select the appropriate device for the left audio channel. If you are seeing the message No input channel was found! [like shown in the screenshot above], please connect your ASIO device. ▪ Right Channel - Select the appropriate device for the left audio channel If you are seeing the message No input channel was found! [like shown in the screenshot above], please connect your ASIO device. Will let you configure your ASIO device further if advanced settings are available. Usually, the ASIO drivers that come with your interface will be launched. Make sure that your ASIO hardware is connected. Or else, no configuration window may be launched. ▪ In this configuration window you can set various settings. The music analysis will be more precise if the latency / amount of samples is as low as possible. Often, this setting is called 'Buffersize'. You can achieve milliseconds with ASIO. 1000 frames represent 1 ms. 500 frames represent 2 ms. 250 frames represent 4 ms, and so on. You will be able to see the number of frames that is captured in the Task Watcher. ▪ Click Apply to save the settings. You need to activate the audio analysis in order to use it! ▪ Activate Audio on the MADRIX user interface. The Audio button can be automatically activated every time you start MADRIX. ▪ Level of the audio signal. You are able to adjust parameters for the audio analysis. ▪ S2L M2L Performance - Defines how much data is available for the audio analysis. The default value is 3. - The higher the value, the more data is available and the more precisely especially M2L Effects can be. That also means that the delay increases [in ms]. If the value is too high, it can affect the performance of MADRIX/of the computer. ▪ M2L Cleaner - Works only for M2L Effects and harmonic frequencies. It cleans the incoming audio signal for resonances and secondary frequencies to filter out unwanted tones. - The higher the value, the more likely a note/tone has in fact occurred in the music. But the higher the value, the more notes will be filtered out as well. ▪ M2L Threshold - Works only for M2L Effects and defines a threshold value. - The higher the value, the more likely a certain note/tone has in fact occurred in the music. - The lower the value, the more notes will be used for M2L Effects. - Setting up a very low M2L Sensibility value [such as 0] can require a lot of computer performance and might negatively affect the display of S2L Effects and M2L Effects. Increase the value again if you are experiencing any issues. Different styles of music may require different Audio Performance settings for an optimal display. ▪ Select Preferences > Device Manager... > Audio Input > Defaults to restore the default settings. Alternatively, select the correct audio device [e.g., Stereo Mix]. Then, click Apply. Click OK to close the window. ▪ Check if the Audio button is activated. 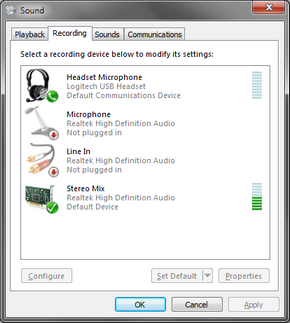 ▪ Check the Windows audio settings using the Windows Mixer if your recording device is configured correctly. 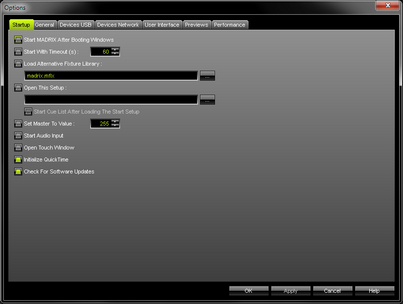 ▪ Check the installation of the [latest] drivers of your sound card. ▪ Check the installation of Microsoft DirectX®. ▪ Test with a different sound card. ▪ If you are encountering problems with ASIO [when effects freeze or single frequencies overmodulate], change the latency settings. A higher latency can solve the problem.